Francis's parents were childless for many years, but following prayers for the intercession of Saint Francis of Assisi, they had three children; Francis was the oldest. Following a pilgrimage in his teens to Rome and Assisi in Italy, he became a hermit in a cave near Paola. Before he was 20 years old he began to attract followers. By the 1450's the followers had become so numerous that he established a Rule for them and sought Church approval. This was the founding of the Hermits of Saint Francis of Assisi, who were approved by the Holy See in 1474. In 1492 they were renamed the Franciscan Order of Minim Fiars, which means they count themselves the least of the family of God. Prophet. Miracle worker. Reputed to read minds. In 1464 Francis wanted to cross the Straits of Messina to reach Sicily, but a boatman refused to take him. Francis laid his cloak on the water, tied one end to his staff to make a sail, and sailed across with his companions. Franz Liszt wrote a piece of music inspired by the incident. Defender of the poor and oppressed. Gave unwanted counsel and admonitions to King Ferdinand of Naples and his sons. Traveled to Paris at the request of Pope Sixtus IV to help Louis XI prepare for death. Used this position to influence the course of national politics, helping restore peace between France and Brittany by advising a marriage between the ruling families, and between France and Spain by persuading Louis XI to return some disputed land. In an old tradition that has certain saints opposing on an equivalent demon, Francis is the adversary of Belial since his simple humility cancels the demons raging pride. Fix your minds on the passion of our Lord Jesus Christ. Inflamed with love for us, he came down from heaven to redeem us. For our sake he endured every torment of body and soul and shrank from no bodily pain. He himself gave us an example of perfect patience and love. We, then, are to be patient in adversity. Take pains to refrain from sharp words. Pardon one another so that later on you will not remember the injury. The recollection of an injury is itself wrong. It adds to our anger, nurtures our sins and hates what is good. It is a rusty arrow and poison for the soul. It puts all virtue to flight. Educated by the Jesuits in the Visayas, a section of the Philippines. Pedro could read, write and speak Visayan, Spanish, and Chamorro, paint, draw, sing, and worked as a carpenter. Teenage catechist who worked with Spanish Jesuit missionaries to the violent Chamarros in the Ladrones Islands (modern Marianas) in 1668. 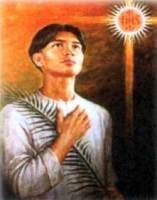 Because he was a Christian on a mission to catechize the Chamorros, and Baptisms, Calungsod was murdered by two natives. 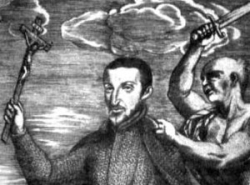 He died trying to defend Father Diego Luis de San Vitores. Martyr. Born to the Hungarian nobility. Ordained on 24 August 1915. Chosen bishop of Gyõr, Hungary on 21 January 1941 by Pope Pius XII. Conventual chaplain ad honorem of the Sovereign Military Order of Malta. Known for his hard work, his efforts for social justice, his support of the poor, his protection of the weak. Provided emergency supplies to Jews being deported through his town. Sheltered those made homeless by air raids. Hid and protected women from brutalities of Russian soldiers who were closing in on Germany at the end of World War II. Shot on a Good Friday by a drunken Red Army officer who was chasing women who had fled to bishop Vilmos for protection; he died three days later. One of ten children. His father, Peter, died when Francis was only four. Confirmed in 1818 at age six. Entered the seminary at Vichy, France in 1822 at age ten. Student with Saint Anthony Mary Claret. Even as a kid he taught grammar and catechism to local children. Francisco joined the Dominicans at Vichy in 1830 at age eighteen. When monastic orders were suppressed by the government, Francis continued to study covertly. Ordained on 28 March 1836 at Vichy. Parish priest of Arles, France. Re-assigned to Moya in 1839, an area devastated by war, awash with starving refugees. He established charitable organizations to feed and house them, and he worked with the poor and displaced for ten years. 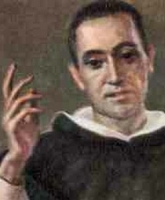 Helped Saint Anthony Claret found the Apostolic Fraternity in 1846. Director of the tertiaries in Vichy. In 1850 he re-opened the suppressed Dominican monastery, and began a program of preaching throughout the Catalan region. Worked with cholera victims during the epidemic that struck in 1854. Founded the Congregation of the Dominican Sisters of the Annunciation of the Blessed Virgin Mary (La Annunciata) in 1856, a teaching branch of tertiaries; by his death the order had grown to fifty houses, and today there are over 140 in Europe and America. Struck blind during a homily given at Sallent on 2 December 1869; his health was never the same, but he refused to retire. When the Dominicans were allowed to officially return to the region in 1872, they found that Francis has somehow maintained the primary structures, physical and administrative, and instead of starting all over, they reclaimed what was theirs, and took up their work where they had left off. Greek Catholic. Ordained on 2 October 1909. Received a doctorate in Dogmatic Theology in Rome, Italy. Entered the Redemptorist novitate at Zboysko in 1919, making his vows on 16 September 1920. Spiritual director and professor at the seminary in Stanislaviv (modern Ivano-Frankivsk), Ukraine. Appointed Apostolic Visitor to Ukrainian Catholics in Volyn and Polyssya by Pope Pius XI in 1926. Bishop on 2 February 1931. Apostolic Exarch in Volyn and Pidlyashia during the Bolshevik occupation. Arrested for his faith on 11 April 1945 by the NKVD; sentenced to six years forced labour in Siberia. Worked in a blacksmith shop, ministered to other prisoners, and ruined his health. His six year sentence continued for eleven years, and after his release he lived under constant surveillance and irregular torture. Martyr. Born to wealthy, prominent and non-Christian family. Brother of Saint Aedesius of Alexandria. Well educated, studying rhetoric, philosophy and civil law in Beirut, Lebanon. Convert to Christianity. Friend of Eusebius of Caesarea; the pair made a pilgrimage to Palestine. Studied under Saint Pamphilus. In May 305, Emperor Maximinus declared that everyone should take part in public sacrifices in celebration of his coronation. When it came time for the sacrifices in his city, Appian went to the temple and stopped the official, Urbanus, from offering incense to an idol, explaining that it was impious to worship an idol instead of the true God, and berating the judge for doing it. Appian was beaten, imprisoned, his flesh torn off with iron claws, and roasted over a slow fire. He was then ordered to sacrifice to the Roman gods; he declined. Martyr. Convert. Studied at Douai, France in 1574. Ordained on 7 April 1576. Returned to Ingatestone, Essex, England, ministering to covert Catholics and bringing many back to the Church. Worked with Saint Cuthbert Mayne. Arrested for his work in 1577, he was exiled to Douai in 1579. Returned to England in 1581 to resume his work. Betrayed by by John Eliot, a known murderer who made a career of denouncing Catholics and priests for bounty, he was arrested in Warwickshire, tortured several times, accused of plotting to kill the queen based solely on Eliot's testimony, and executed. Martyr. Bishop of Langres, France in 374. During a priod of persecution of the Church, Urban hid for a while in a vineyard. There he converted the vine dressers, who then helped him in his covert ministry. Due to their work, and to Urban's devotion to the Holy Blood, he developed great affection to all the people in the wine industry, and they for him. Born to a peasant family, he was a shepherd as a boy. He early showed signs of a religious vocation, and joined the Franciscans at age 19. Ordained in 1757. Taught philosophy and theology. Mission preacher. Minister-Provincial of Umbrian in 1781; his term was noted for insisting on study and adherence to his Order's Rule by the friars, and support of the friars by their superiors. Established a cloister at Monte Luco near Spoleto, Italy, and lived there in solitude and silence for several years; it was closed in 1809 due to political suppression of monastic houses, and Leopold returned to life as a parish priest, working in periods of silent prayer whenever his schedule permitted. The community at Monte Luco was restored in 1814, Leopold immediately returned there, and spent his remaining months as a prayerful, silent monk. Abbess at Coldingham, Berwickshire, Scotland, a double monastery that had been founded by Saint Ebbe the Elder, and which was the largest in the country at the time. When the monastery was attacked by Scandinavian pirates, Ebbe gathered her nuns and exhorted them to save themselves from falling into the hands of the pirates by voluntary disfiguring themselves. She then set an example by cutting off her own nose and upper lip; the other nuns did the same. 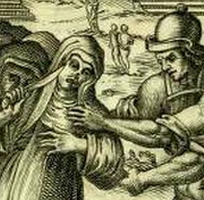 When the Vikings broke into the convent, they were so horrified and angry by what the women had done to escape being raped, they locked them all in, set fire to the house, and burned them all to death. Priest. Bishop of Como, Italy. Noted theologian. Attended the Council of Constantinople in 450. Diplomat from Pope Leo the Great to Emperor Theodosius II. Papal legate to the Council of Chalcedon in 451. Attended the Council of Milan in 452. Fought Eutychianism, which denied Jesus' human nature, and Nestorianism. Sometimes credited with the authorship of the Te Deum. Monk. Spiritual student of Saint Columbanus. Head of the monastic school at Luxeuil Abbey. 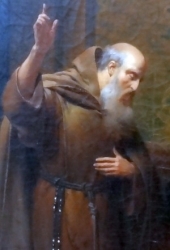 Abbot of Luxeuil in 611. During his abbacy the abbey had 600 monks and ran a seminary that sent many bishops and saints into the world. Noted for his humility, lengthy fasts, and for spending his time either at work or prayer. 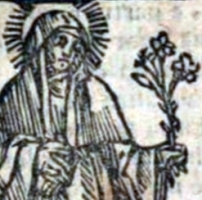 Healed Saint Sadalberga of blindness. Jesuit missionary priest. Founded the first Catholic church on the island of Guam. Established the Spanish presence in the Mariana Islands. Imprisoned, tortured and executed in her late teens for encouraging other martyrs to not give up their faith. Martyr. Poor Clare nun. Founded the Poor Clare monastery in Foligno, Italy where she was admired for her great piety. After leading a worldly and dissolute life, Drogo became a Benedictine monk at the abbeys of Fleury-sur-Loire and Baume-les-Messieurs in France. Noted for his piety. Around 950, he received a vision of Saint Benedict of Nursia, confirming his conversion to religious life. Nun. Abbess of Gleannsechis (Kill-sechis), Ireland. 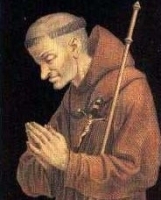 Nephew of Saint Sacerdos of Lyons. Bishop of Lyon, France in 553. Worked to revive ecclesiastical chant. Benedictine monk. Abbot of at Weingarten abbey in Swabia (in modern Germany) c.1188. Priest. Founded a monastery in Maine, France. Spiritual teacher of Saint Agnofleda of Maine. Nun. Spiritual student of Saint Lonochilus of Maine. King of Scotland. Died in battle fighting invading heathens, and thus considered a martyr. Young girl in 6th century Rome, Italy who had visions and mystical experiences. Saint Gregory the Great wrote about her. Bishop of Capua, Italy in 541. Noted ecclesiastical writer. A group of ten Christians martyred together in Africa, date unknown. We have six of their names - Marcellinus, Procula, Quiriacus, Regina, Satullus and Saturnin, but no other information has survived. Sixteen Christians who were martyred together in Thessalonica in Greece, date unknown. We know nothing else about them but 13 of their names – Agapitus, Agatophus, Cyriacus, Dionysius, Gagus, Julianus, Mastisius, Proculus, Publius, Theodoulus, Urbanus, Valerius and Zonisus.